If you are looking for bake mixes and snacks that meet your dietary needs or preferred eating plan, you just might find that Simple Mills has some terrific items you can use to stock your pantry. They offer a terrific section of non-GMO baking mixes and packaged snacks that are gluten free, soy free, grain free and paleo friendly. If you've longed for pre-made snacks and convenience mixes that will fit in with your way of eating, be sure to check out the great options from Simple Mills! The Simple Mills brand team found out that I was on the lookout for diet-friendly treats, so they sent me samples of several items for review purposes. I had an opportunity to check out a few bake mixes (cake, cookies, and bread), as well as frosting, crackers and pre-made cookies. It was a real treat to discover such a versatile product line focused on meeting the needs of health conscious consumers who don't want to sacrifice great taste! Simple Mills offers a wide selection of bake mixes that have an almond flour base. There are options available for just about any item you might want to make. Cake - Their vanilla cupcake and cake mix whips up a tasty treat that you can top off with your choice of pre-made vanilla or chocolate frosting. Muffins - They also have a selection of muffin mixes. Flavors include pumpkin, banana and chocolate. Of course, you can make a chocolate cake, banana bread, or pumpkin with the muffin mix. Cookies - You can also whip up healthful chocolate chip cookies with their only flavor of cookie mix. Savory mixes - Their bake mixes aren't all sweet. They offer a tasty pancake & waffle mix, as well as artisan bread and pizza dough. I really liked all of the Simple Mills bake mixes that I tried. If you don't like almond flour, you probably won't care for these. However, as a fan of almond flour, I really enjoyed the flavor. Bake mixes are great, but there isn't always time to throw together fresh baked goods, even when you have easy access to packaged mixes that fit in with your way of eating. For such occasions, it's great to be able to keep diet-friendly crackers and cookies on hand in the pantry. Cookies - They offer ready-to-eat cookies in a variety of flavors, including chocolate chip, toasted pecan, cinnamon and double chocolate. I tried the cinnamon and toasted pecan cookies and found them to be very tasty. Crackers - The cookies are good, but the almond flour crackers are great, in my opinion. That's probably because I have succeeded at making healthy cookies before, but I have never experienced success with a carb controlled or gluten free cracker recipe. 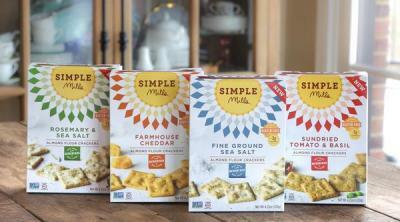 Simple Mills offers several flavors, including farmhouse cheddar (my favorite), fine ground sea salt, sundried tomato & basil, and rosemary & sea salt. Again, you can definitely tell that these are made with almond flour. If you are a fan of almond flour, you will likely find these items to be very enjoyable. 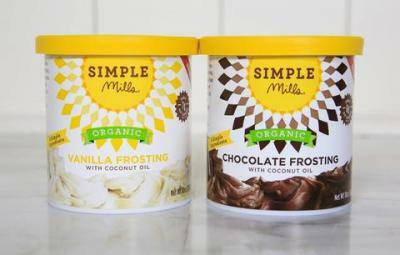 If you're looking for a simple solution to satiate your sweet tooth without filling up on grain products or refined sugar, I highly encourage you to check out the Simple Mills line. Use their store locator to find a retailer near you, or shop online from the company website or Amazon.